New tactics are being deployed by several state departments of transportation to address the growing difficulties in recruiting and retaining workers across a number of disciplines, from engineering and finance to entry-level labor and equipment maintenance positions. 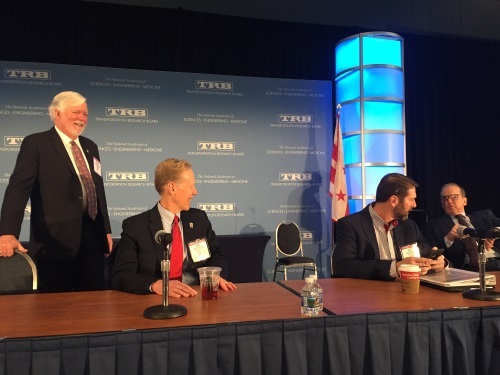 “One of things we are doing is sounding the alarm; just broadcasting the facts about our workforce situation,” noted Roger Millar, secretary of the Washington State Department of Transportation, during a panel discussion Jan. 15 at the 2019 Transportation Research Board’s annual meeting in Washington, D.C. He used WSDOT as an example of the industry’s workforce issues: an agency with a $3.2 billion budget that employs 7,000 across Washington state. Yet while pay is important, Millar said for WSDOT to become and remain an “employer of choice” will take more than just money: “We need to commit to our workforce so they will commit to us. If you want respect and loyalty [as a state DOT] you need to show it,” he stressed. For example, Millar said two-thirds of WSDOT’s employees are on “flexible work schedules” that are not traditional “nine-to-five” shift, with another 15 percent telecommuting. The agency is also pilot testing in-house daycare in order to retain new parents. “Daycare is expensive and by doing this we’re building loyalty with those parents; they end up sticking around for a while,” he noted. Millar added that WSDOT also creates a lot of “gig” part-time/temporary employment to give retired employees work. “That keeps a lot of our expertise in house,” he explained, adding that the agency is also providing a lot of training and giving people “access to interesting new stuff” to keep workers on board. Oklahoma Department of Transportation Secretary Mike Patterson said he’s engaged in similar efforts, such as letting new parents bring their children to work, providing nursing rooms and other accommodations. Scott Bennett, director of the Arkansas Department of Transportation, added that maintenance workers, truck drivers, and day laborers are becoming “some of the hardest positions to fill” within his organization. For that reason, his agency is looking at recruiting workers from more “non-traditional” labor pools, as well as partnering with two-year educational institutions to offer more vocational training opportunities to train a new generation of plumbers, welders, and the like. John Schroer, now-retired as commissioner of the Tennessee Department of Transportation, added that many state DOTs have a built-in advantage as they can offer jobs in rural parts of their states; areas that may not have as many employment opportunities compared to more urbanized locales. “Many people want to stay in their communities and a DOT job is a valuable one in those areas; it can attract good people,” he said.